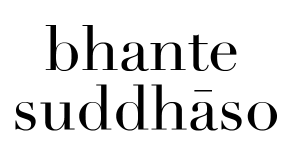 Bhante Suddhāso has written several articles on a wide range of Dhamma-related topics. As they are published, they will also be linked to from here. Basic instructions for practicing meditation. Includes descriptions of appropriate physical posture, mental attitude, and several different meditation techniques. An explanation of the basis for moral guidelines in Buddhism, and why good moral conduct is conducive to happiness. An article on how to expand our practice beyond the confines of meditation, focusing particularly on how generosity directly supports our spiritual development. A detailed guide to developing the perception of impermanence as a meditation practice.